Today, staff and faculty from Red Cloud Indian School’s Lakota Language Project are presenting the school’s acclaimed K-12 comprehensive language curriculum to administrators, educators, politicians, students and professionals at the annual National Indian Education Association (NIEA) Conference. The conference, held in Anchorage, Alaska this year, is widely seen as the the premier exhibit of innovative, culturally-responsive educational programming in the country. 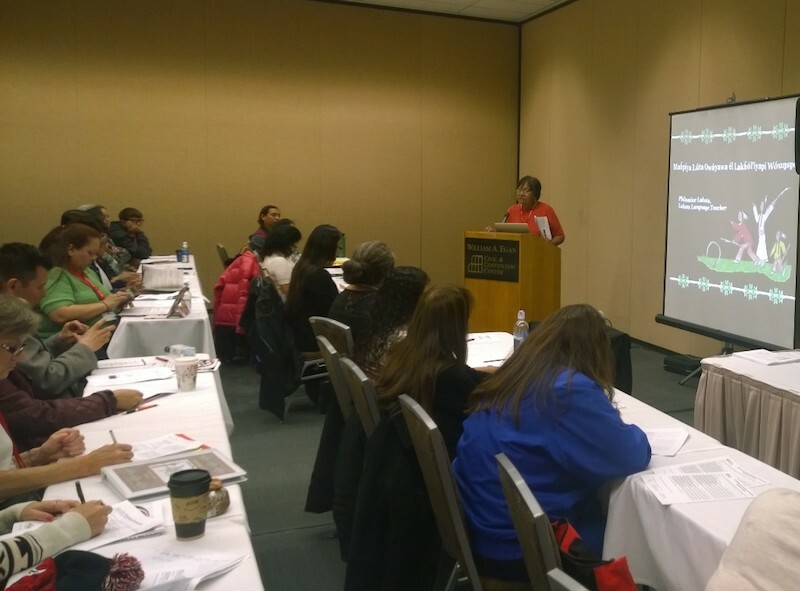 Last year, staff unveiled the nation’s first comprehensive K-12 Lakota language curriculum at the NIEA conference after six years of developing lessons, materials and strategy to support the revitalization of the endangered language. The announcement garnered praise and support from educational institutions and media outlets around the country. This year, staff and faculty returned to the conference to announce the start of ‘Phase Two’ of the project and share the success they’ve seen so far. For staff, participating in this year’s conference is more than an exhibit, it is an opportunity to inspire other people and communities, and to encourage those already engaged in revitalizing Native languages. “We want to share our language project so that others who are interested in developing their own programs may use it as a model, as well as to gain exposure and support for our language preservation efforts. ” says Robert Brave Heart Sr., executive vice president of Red Cloud Indian School, and the projects founding director. Sharing best practices with schools considering similar curriculum development projects is what makes the NIEA conference such an important event for Nicky Belle, the Lakota Language Project’s materials developer. He stresses that sharing successes and challenges is a two-way street. With the new school year, staff and faculty at Red Cloud are busy with ‘Phase Two’ of the Lakota Language Project, which aims to increase community engagement, the number of available language materials, and support language use outside the classroom. This year marks a turning point in the Project and a focus on sustainability and long-term success. With the support of the NIEA community, Red Cloud believes the future looks especially wiyákpa!